Nobody wants to go through a hard time eating just beans and rice. I’ve heard frequently that “if you’re hungry enough, you’ll eat anything.” But why should you need to when you can have foods you love in your food storage? Comfort foods are familiar. They taste good and provide an emotional boost. And who doesn’t want to be happy eating their food storage? If you’re using it because you need it, you’re probably already stressed enough! Bring on the comfort foods! 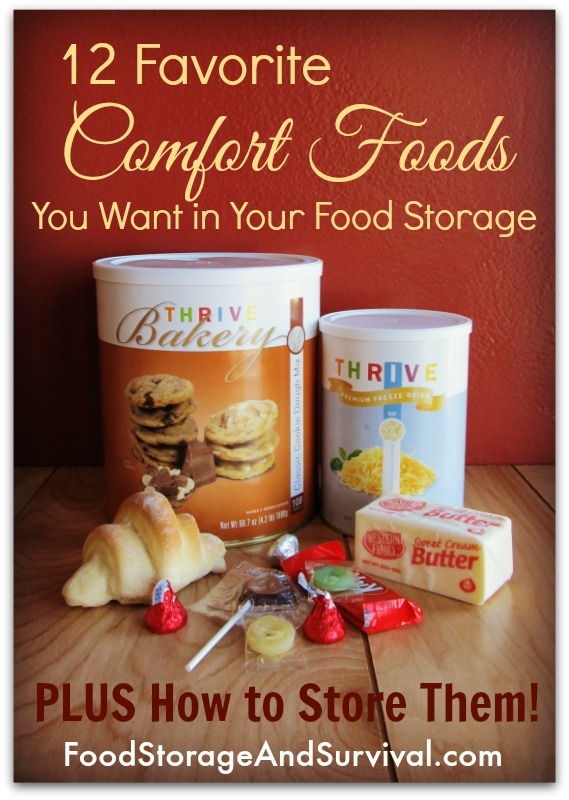 Here are twelve favorite comfort foods you want in your food storage, plus the best ways to store each one to keep them tasty and ready to eat when you want them! Not too many meals go by here without someone eating bread with it! Toast, sandwiches, rolls, breadsticks, pizza crust, scones (the western kind). It’s all bread. Baked bread can be stored in the freezer for about 4 weeks. Not too long, but not bad if you catch bread on sale or want to bake six loaves at a time and freeze some for later. Purchase bread dough mixes. Honeyville makes a really tasty scone (fry bread) mix, and Thrive Life has an amazing white or wheat dough mix. Shelf life on these is about 3 years unopened. For any of these mixes, you’ll need to store yeast as well. Store yeast purchased at the grocery store in the freezer to prolong shelf life. I know this is really two ingredients, but they surely go together well! Not much better than a big pile of mashed potatoes with gravy spilling over them to warm the soul. Potatoes from the store or garden can be stored in a cool, slightly moist environment for 3-6 months. Potato flakes. Already canned, like the mashed potatoes from Thrive Life, potato flakes store easily on the shelf for up to 25 years. If you purchase boxed potato flakes at the store, you’ll want to repackage them in a Mylar bag or bucket to keep them fresh. Gravy can be made from the drippings of meat or using broth made with bouillon. You’ll want a thickener like corn starch or white flour to thicken it up. Gravy mixes are also available. Bechamel (white sauce), Veloute (chicken gravy), and Espagnole (beef gravy) are packaged to store for 10 years on the shelf. Gravy packets can also be purchased at your local grocery store and stored by sealing in mason jars or in Mylar bags. Warm cookies from the oven! Yum. Chocolate chip, oatmeal, sugar cookies. What’s your favorite? Store bought cookies (off the shelf, not from the bakery) can be stored for up to 1 year by vacuum sealing them in mason jars. Purchase cookie mixes. Mixes from Thrive Life are packaged to have a shelf life of 3 years and include Classic Cookie Mix (for chocolate chip type cookies), Sugar Cookie Mix, and Coconut Macaroons. To make boxed mixes last longer than their printed expiration date, repackage them in buckets or Mylar bags with oxygen absorbers. MAKE SURE you read the directions for making the cookies from the mix so you have the necessary ingredients in your storage! Some call for butter, some for eggs (you can substitute powdered eggs), some for oil, and some for just water. Store the ingredients to make cookies. Look for recipes that use oil or shortening rather than butter for longer storage life. Store ingredients in air tight, pest proof packaging like #10 cans or food grade buckets. For shelf life of ingredients see this Food Storage Shelf Life Chart. Cake in your food storage can help with celebrating special occasions like birthdays during hard times as well as make a quick treat for a potluck or school party! Purchase cake mixes from the store. To increase shelf life past the printed expiration date, repackage them into buckets or Mylar bags with oxygen absorbers. Be sure you have the additional ingredients in your storage as well, usually oil, eggs (can use powdered eggs), and water. Learn to make a cake from scratch and store the ingredients for cake. This is a little more time consuming, but storing ingredients gives you a lot of flexibility in what you choose to make with them. For shelf life of ingredients, see this Food Storage Shelf Life Chart. Sugar is a quick pick me up, and one easy way to get snackable sugar in your storage is with hard candies. Purchase hard candies, preferably individually wrapped, and store on the shelf. For longer shelf life, vacuum seal them in mason jars using a FoodSaver type vacuum sealer and this jar sealer attachment. Learn to make hard candy! You’ll just need to store sugar or honey and have a way to heat it and a candy thermometer. Could the world exist without chocolate? Available in a variety of forms, chocolate is one of my weaknesses! You know I have some in my food storage. Chocolate candy can be purchased (post-holiday sales are great for this!) and stored in the freezer or vacuum sealed in a mason jar using a vacuum sealer and jar sealer attachment. This includes chocolate chips. Hot cocoa. Drinkable chocolate that’s also warm for those winter months or camping trips. Stores very well on the shelf. Brownie mix. As with the cookie mixes, make sure you know what other ingredients you’ll need to store. Thrive Life’s brownie mix has a three year shelf life and only requires adding water. Boxed mixes from the store may need oil and/or eggs added (again, you can use powdered eggs). Repackage boxed mixes in buckets or Mylar bags with oxygen absorbers to extend shelf life past the printed date. Baking cocoa (this brand is my favorite!) adds the ability to make chocolate goodies like cake, brownies, breads, and cookies from your stored ingredients. This is from my kids’ list, and actually one of the trickier food storage foods to store. Tricky, but not impossible! Store the ingredients for ice cream. Get your shelf stable cream with this heavy cream powder. You’ll also need sugar, flavoring (added freeze dried fruits are awesome! ), and ice and rock salt. Make it in an ice cream mixer (hand crank for the powerless times) or using the shake method with baggies or cans. Store freeze dried ice cream. It tastes like ice cream, it just isn’t cold. Available in a variety of flavors and even ice cream sandwiches! Cheese is a staple in most of our meals around here. Macaroni and cheese, pizza, grilled cheese sandwiches, casseroles, burritos, and I’m sure that’s not all. Cheese is right up there with chocolate in my opinion! Waxed cheese is shelf stable and does not need refrigeration. It gets super sharp quickly, so I’d recommend starting with mild cheese and eating it within 3 months. Store block cheese in the freezer. The texture sometimes gets a bit crumbly after defrosting, but if you’re using it shredded, it’s not too big a deal. Buy freeze dried cheese. Monterey Jack, Cheddar, Colby, Mozzarella, and even Parmesan. After reconstituting, these cheeses melt just like their fresh counterparts. 20 year shelf life in the can. Buy cheese powder. If you’re a lover of macaroni and cheese or want cheese flavor in a casserole dish, cheese powder is one way to get it. 15 year shelf life in the can. Learn to make your own cheese. A learning curve here, but if you have access to the milk to make it, pick up a cheese making kit and give it a try! For spreading on bread or making cookies, real butter just can’t be beat. Butter stores fantastic in the freezer for 6+ months. I keep an ever rotating stash there and have never had a problem. Just put the box in the freezer and swap it to the refrigerator when you’re ready to start using it. Butter powder makes a nice spread, but doesn’t work in baking like fresh butter. It can be used to add butter flavor to your cooking though! 5 year shelf life in the can. Canned butter. Real butter, but shelf stable. Do not, however, can your own butter. Not safe. Use the heavy cream powder to make butter in a churn or by shaking vigorously in a jar. This is also a great option if you have access to fresh cream by owning a cow or living near a dairy. Almost every meal tastes better with some kind of condiment. Ketchup, mustard, mayonnaise, salad dressing, steak sauce. You probably have a favorite. Purchase condiments and store on the shelf. Almost all are shelf stable until they are opened. Pay attention to expiration dates and rotate them into your regular eating. Learn to make your own condiments and store or grow the ingredients. Herbs, tomatoes, oil, sugar, and spices can make a variety of sauces. Find a recipe for the condiment you love and start experimenting with making your own. Pizza! What kid wouldn’t love to have pizza in an emergency? Pizza is just four basic parts put together: bread, sauce, cheese, and optional toppings. Sauce. Store bottled pizza sauce. Or the ingredients to make your own sauce (tomato sauce and spices). Or this tomato sauce is really good and quick to mix up. Optional toppings. Freeze dried vegetables and meats like sausage work great for topping pizzas, now and in a disaster. Pizza meats like pepperoni and Canadian bacon purchased at the grocery store can also be stored in the freezer. Filling, nutritious, and great on sandwiches or in cookies, peanut butter is a food storage staple. Peanut butter stores on the shelf for up to 3 years. Check expiration dates when you’re buying and purchase the jars with the furthest out expiration dates. Rotate into your regular eating to keep your storage fresh. Peanut butter powder also has a shelf life of 3 years. Peanut flour can be mixed into peanut butter by adding sugar, salt, and oil. Shelf life of 5 years and contains only the ingredients you put into it. What comfort foods are you storing? Let me know in the comments! For items that need baked like bread, pizza, cookies, and cakes, you’ll want a powerless baking method. A Sun Oven, dutch oven and coals, or HERC tea light oven would all work great. For more nuts and bolts information like this on storing and using food storage, check out my book, Food Storage for Self-Sufficiency and Survival!